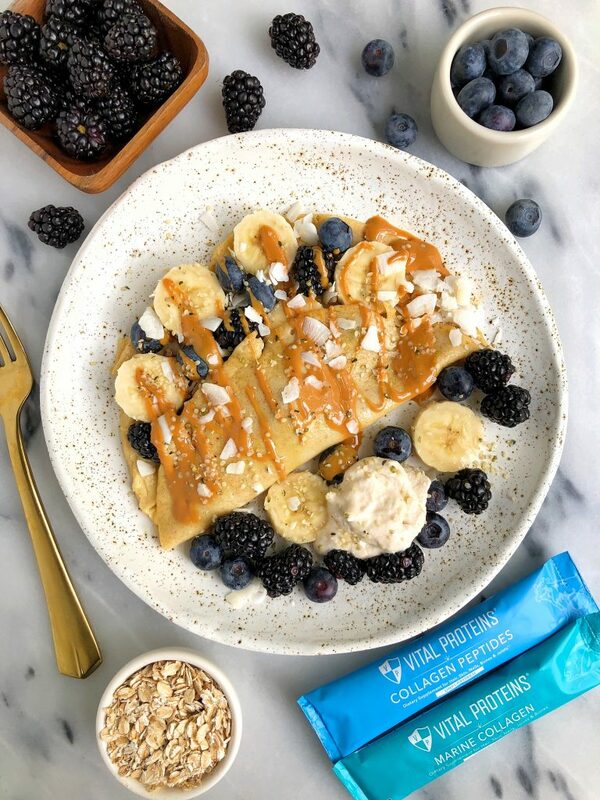 Easy Collagen Breakfast Crepes made with gluten-free and dairy-free ingredients for a simple and healthy breakfast crepe! Whenever someone talks about crepes, I immediately think about a family vacation we went on when I was in middle school. We stayed at a resort in Turks & Caicos and every single day at 4pm they had free crepes for everyone. This was also the first time I ever had a crepe so needless to say, it was a memorable moment in my life. Nutella or peanut butter and banana with cinnamon sugar will forever be my favorite combo. When I had my first crepe in France a few years ago (ok fine it was like a decade ago now), I got the nutella and banana combo. You guys know my love for pancakes is on another level so to eat something like a pancake filled with rich and delicious toppings while walking the streets of Paris? Life doesn’t get better than that. 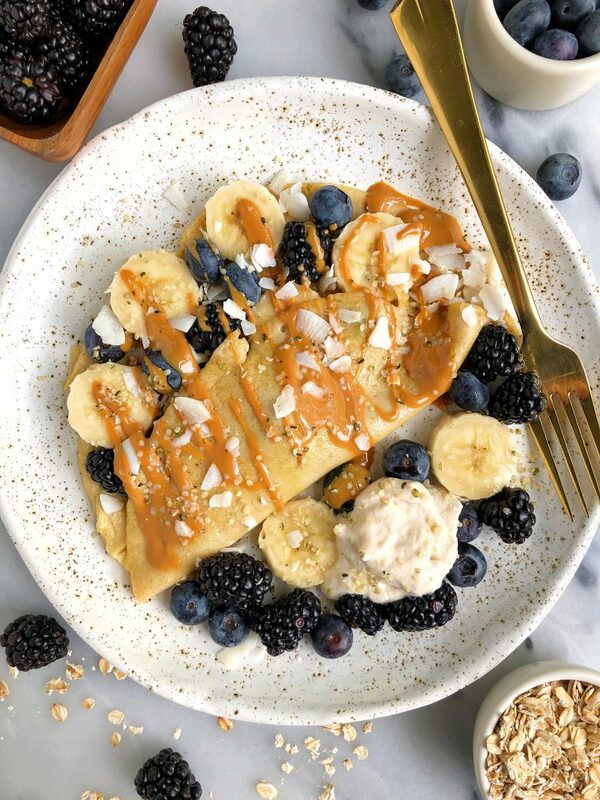 I am surprised it took me this long to make a recipe for the blog for you guys to try, but these Easy Collagen Breakfast Crepes were well worth the wait. They are made with just a few simple ingredients like a pasture-raised egg, oat flour, non-dairy milk and collagen peptides. Adding collagen peptides to this recipe makes them more filling because of the protein and also adds many nutritional benefits for us as we are stuffing our faces with bananas and peanut butter. If you are wondering what collagen is, head on over to my blog post where I breakdown everything you need to know about collagen! This recipe is so easy to make and I love that it only makes 3 crepes. Crepes aren’t the best to eat leftover, I find that they have the best texture when eaten fresh but they do stay in the fridge for a couple days. Just try to wait to add the filling/toppings until you are going to eat. I hope you guys love these healthier crepes as much as I do. 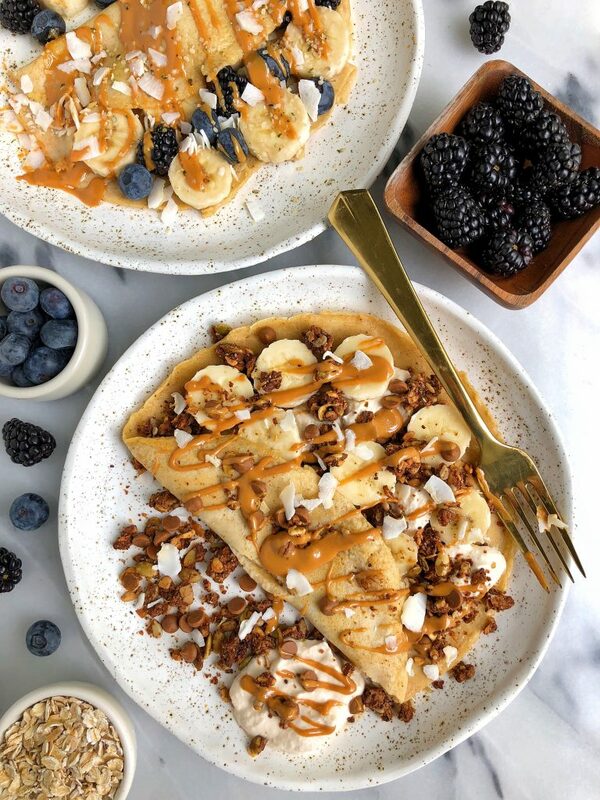 Don’t forget to share your crepes with me on Instagram! I’ve actually never made crepes before! Love how healthy these are to add ALL the toppings! 🙂 Plus I have all of the ingredients on hand at home always! I just made these and they were amazing! I threw a few chocolate chips on top for the last couple of minutes of cook time, folded them up, and drizzled with nut butter. HOLY HEAVEN!! Thanks so much for this super easy, whip up in five minutes recipe. I can also totally see this working as a savory crepe if you took out the cinnamon. I will be making these on the reg! If I want to opt-out of putting collagen in — should I sub in more oat flour or maybe some protein powder?